I recently had the chance to take Devour Barcelona’s winery day trip— one of the first tours I didn’t have a heavy hand in planning myself. 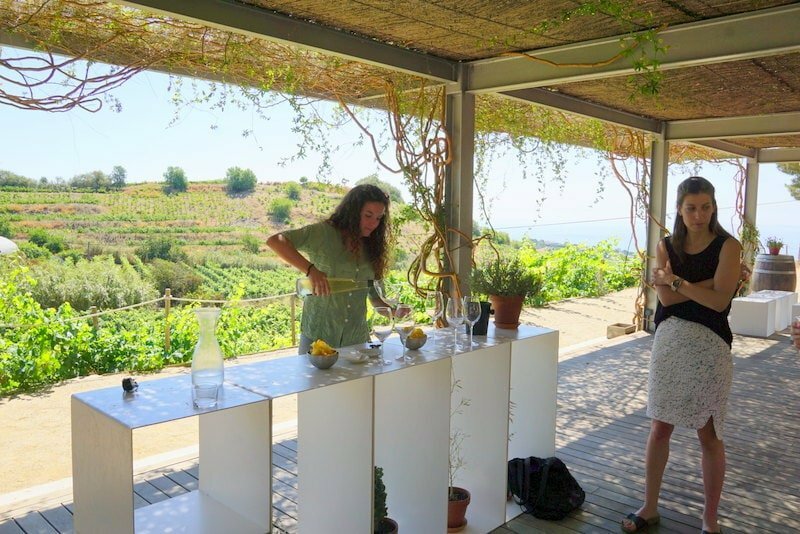 It’s hard to let go– Devour is my baby after all– but this excellent Barcelona winery tour was proof that the time has come! A day filled with wine and fun! What am I doing in Barcelona? I’ve moved to Barcelona– well, kind of. I’m here until at least September, though I will be returning to Madrid from time to time and will also take a quick trip to Lanzarote and week in Asturias later this summer. 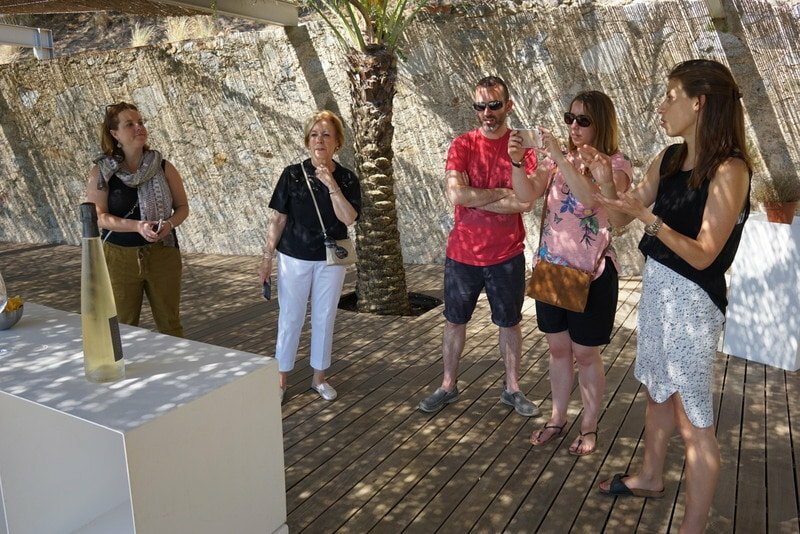 This is the perfect time to experience Barcelona in high-season– I want to make sure all of our tours are working well, get to know the awesome team here, and keep building it! It’s a challenge being away from Madrid (and Ale and Lima) for such a long time, but it’ll be worth it to create some great new tours and experiences here in beautiful Barcelona. 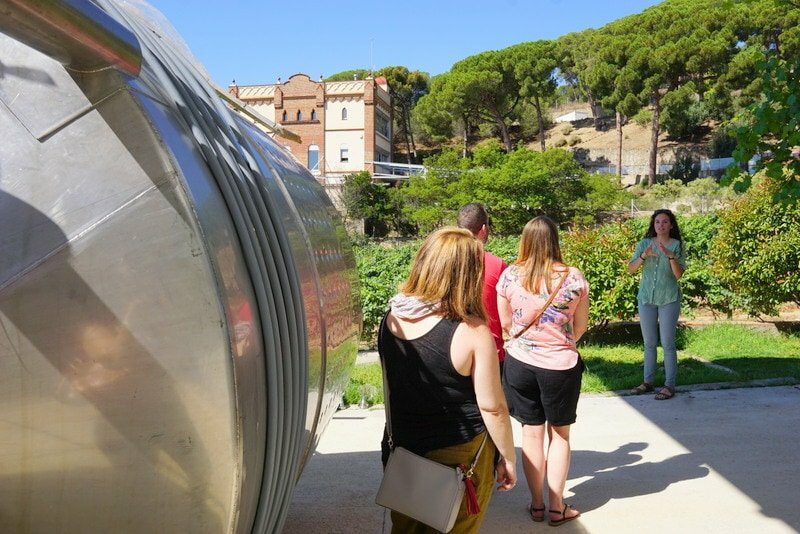 I’m currently two weeks in, and last Sunday I had the chance to jump on Devour Tours’ Farm-to-Table Organic Winery Day Trip, one of our newest winery tours in Barcelona. I love taking winery tours when I travel (I’m currently about to book one in Lanzarote!) so I was anxious to see what my own company had cooked up in the vineyards surrounding Barcelona! Many winery day trips from Barcelona will take you to Penedés or Priorat– and while we have those destinations in mind for future tours, we wanted to start closer to home. 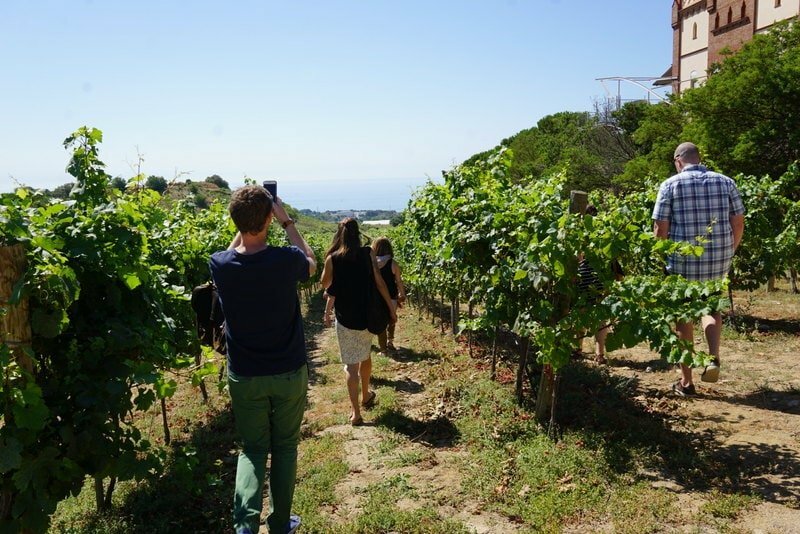 Our Barcelona winery tour takes you to the gorgeous coastal town of Alella, which is also its own wine region (DO). With only a handful of bodegas, it’s a boutique region that focuses on organic wines– perfect for Devour, since sustainability is key in the tours that we offer. 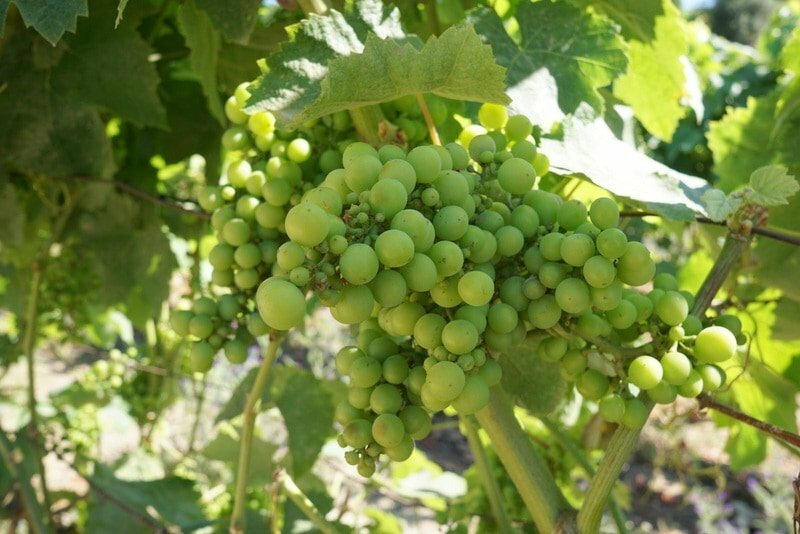 But it’s not a new winemaking region by any means– wine has been produced here since Roman times! Alella may be small (it’s one of the smallest DOs in Spain) but it knows how to make great wines. 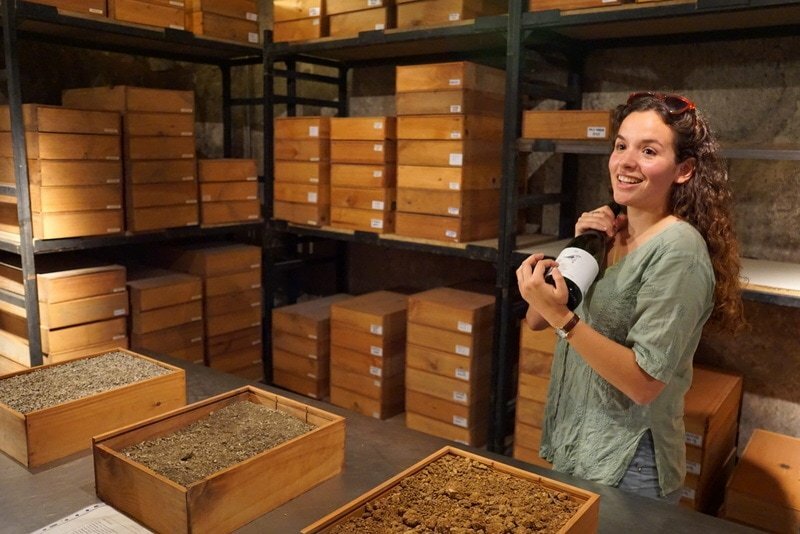 We were excited to plan our Barcelona wine tour in this area because Alella is only a twenty-minute drive from Barcelona, so you don’t lose precious time on a long bus ride. The entire trip is about six hours (9:45 to 4:00) so it allows you to get back to the city, take a siesta, and hit the streets for Barcelona’s awesome nightlife and tapas bars. 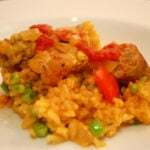 Read more: Check out my extensive guide to eating in Barcelona here! 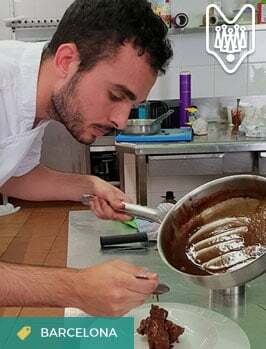 We started the morning with our guide Lior, a chef in training at the prestigious Hoffman school. 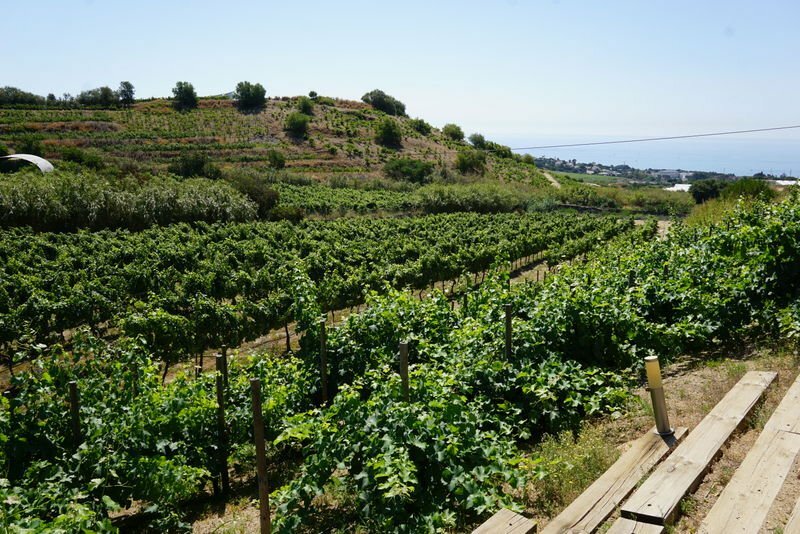 Lior talked to us about the history of this winemaking region on the short ride into Alella. Our bus drivers, Jordi and Montse, weaved through Alella’s small town center and up onto a windy dirt road– we’d reached our first stop. 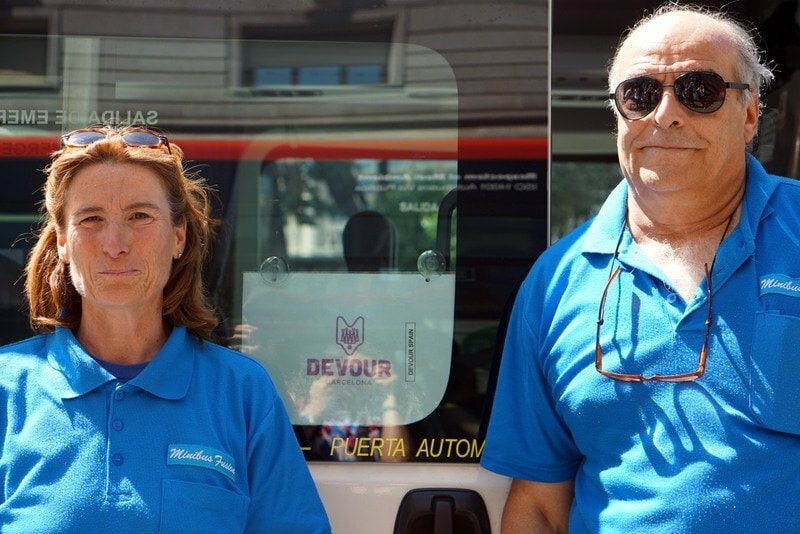 Meet Jordi and Montse, Devour’s bus drivers who are the sweetest people ever. Vines and the sea at Alta Alella. 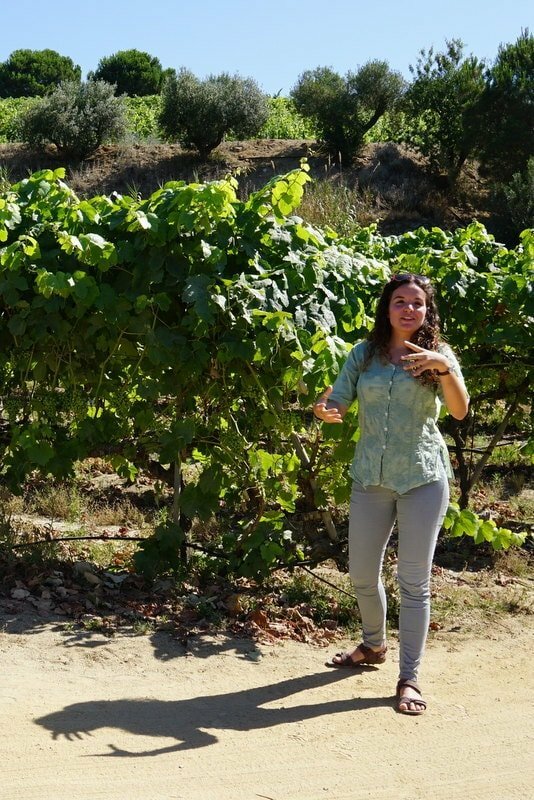 We took an in-depth tour of the vineyard, learning all about the local grape varieties, soils, and production process. 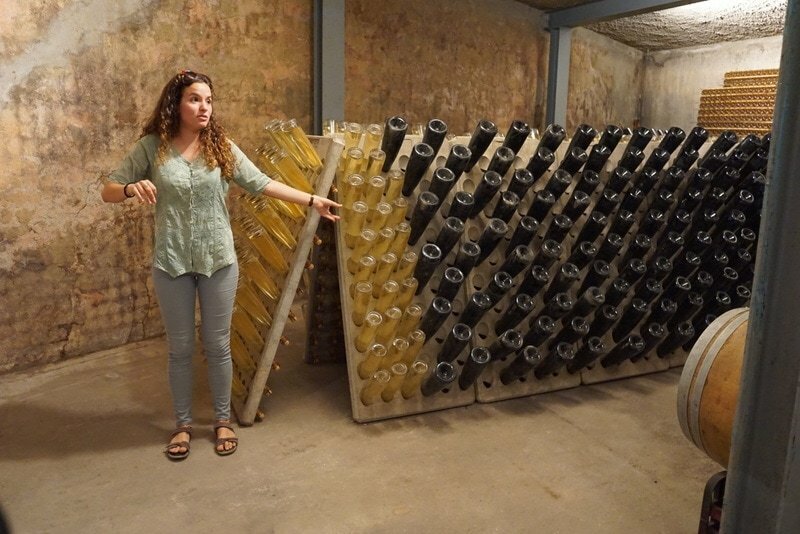 We saw their incredible “cava” (not the wine in this case– the wine caves!) where they age their award-winning cavas (the wine this time!). Learning all about the local grape varieties. Learning about the organic wine making processes. 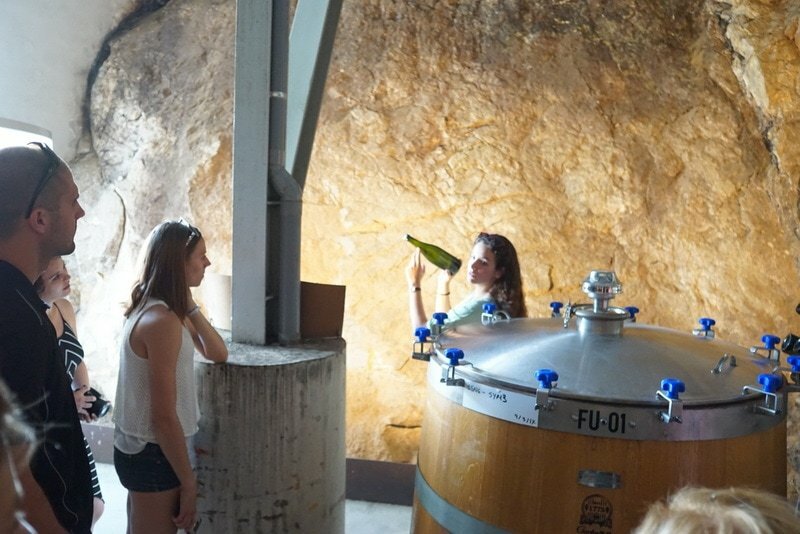 Discovering how they get the yeast out of the cava bottles! 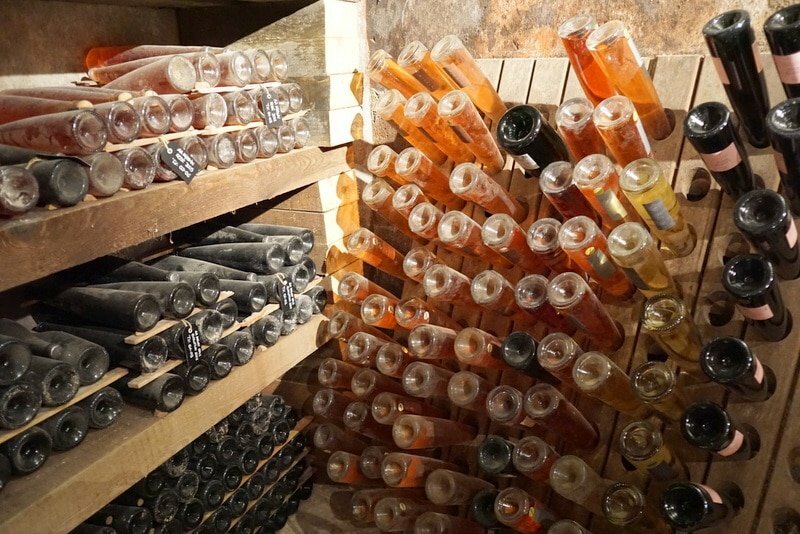 Aging cava– I want one! Their cellars are carved right into the local rock and landscape. Learning about the local soils of the region. 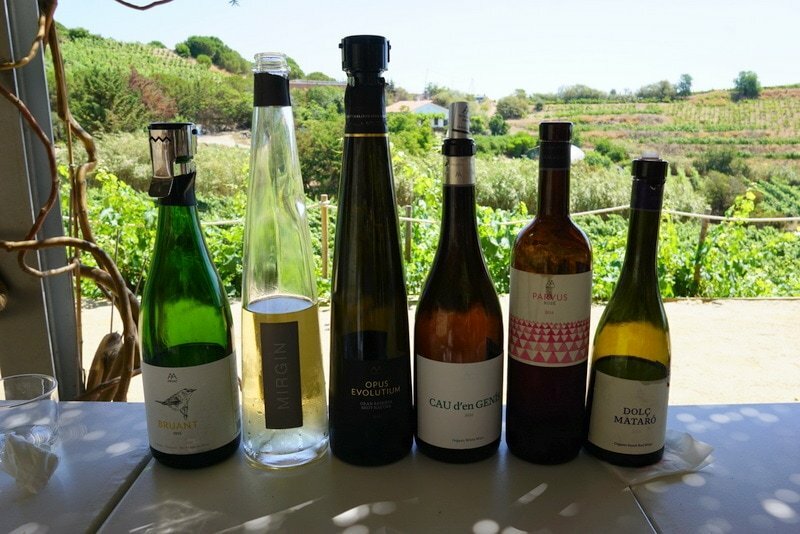 Our tasting consisted of cava, white, red and sweet wine– they really do make a bit of everything. For me, their standout wine was their aged cava, I wanted to take home a couple of bottles but they were already sold out! They are quite a small production and have admirers all over the world. It was bittersweet to leave the Alta Alella vine covered terrace, but Jordi and Montse were waiting, ready to chauffeur us to the next stop! This time we were visiting another type of bodega– a wine shop and vermouth tavern that thrives in a former textile factory. 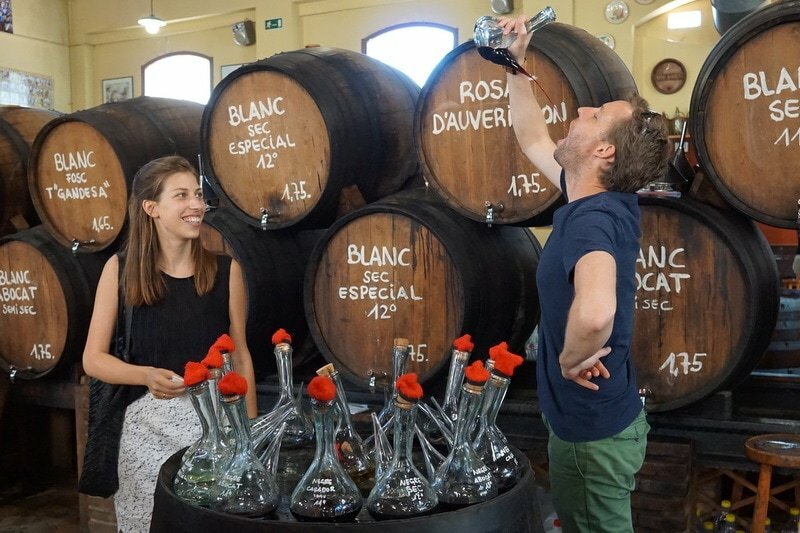 This is a unique stop on a Barcelona winery tour– and an important part of the local culture! And this isn’t just any wine shop, I’d go to say it’s the prettiest in all of Spain. Here in Catalonia buying wine in bulk is still very common– so the rows of barrels in the shop are still in use! We sampled the wines using the porrón, an old-fashioned drinking vessel still used by Catalans to share wine. James practices his porrón skills! 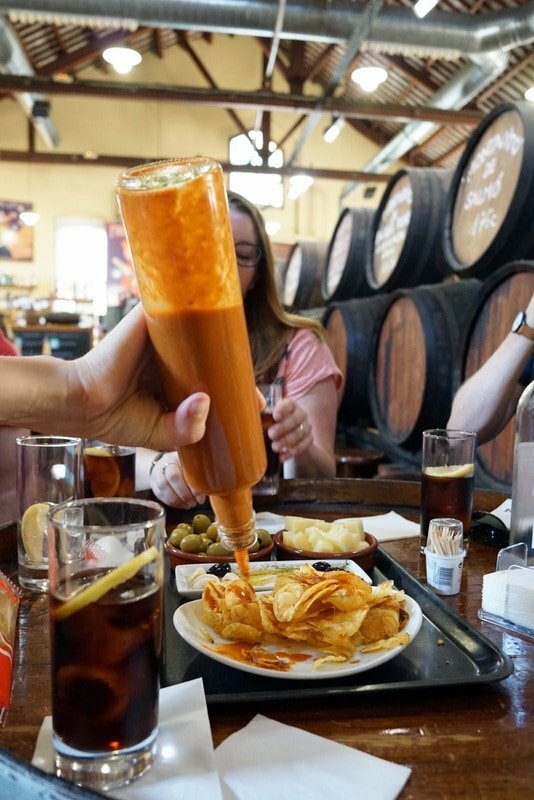 We also “did the vermouth”– an expression used in Catalan to talk about the mid-day tradition of going out for a pre-lunch aperitif (usually a vermouth) but also a beer or wine… and pairing the drinks with delicious tapas like olives, cheeses, and cured meats. This was as local and authentic as it gets. 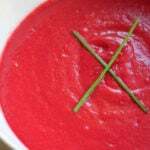 You’ll try Alella’s special sauce on the tour! In hand with our farm-to-table theme, our lunch is at a local “Slow Food” restaurant. 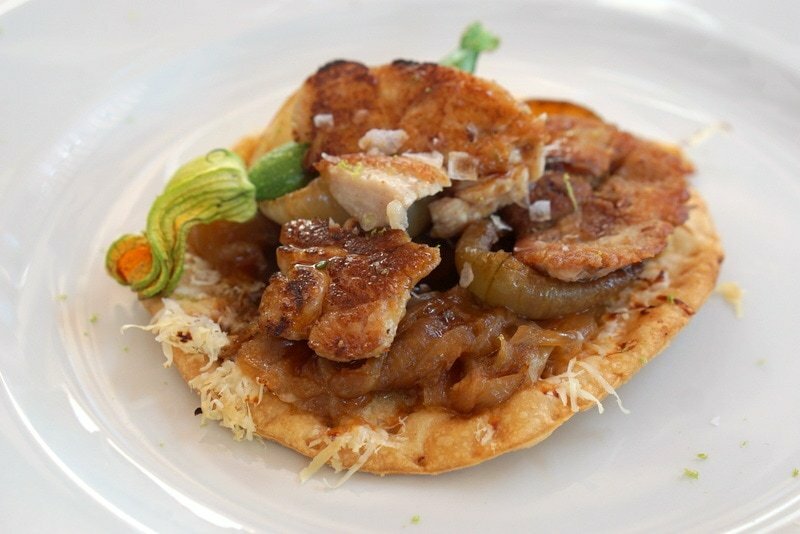 Chef Gonzalo changes his menu daily to be totally in sync with the seasons. He never makes requests of his suppliers– they tell him what they have! This approach was totally new for Alella, and he sometimes worries if they’ll make it. But he is dong a great job so far– most of his clients are locals! 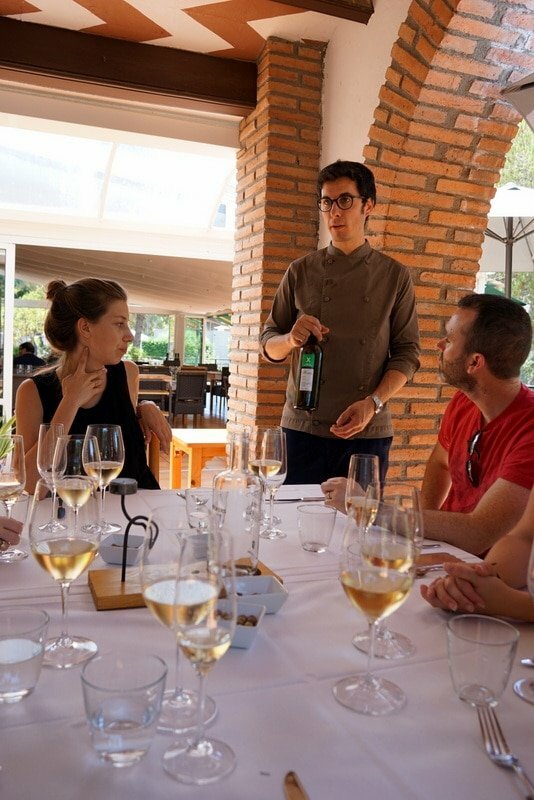 Gonzalo talks about the local wines and his philosophy. 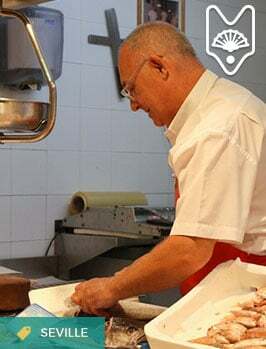 To convince them and educate them, Gonzalo holds occasional cooking classes for the local Alella residents where he discusses not only the recipes but the products themselves. He has people taste the difference between mass-produced veggies and local veggies and explains why there is a price difference. The hardest part of our Barcelona winery tour was deciding which three dishes I wanted during lunch. Everything sounded incredible! In the end, I asked Gonzalo to surprise me– he didn’t disappoint! 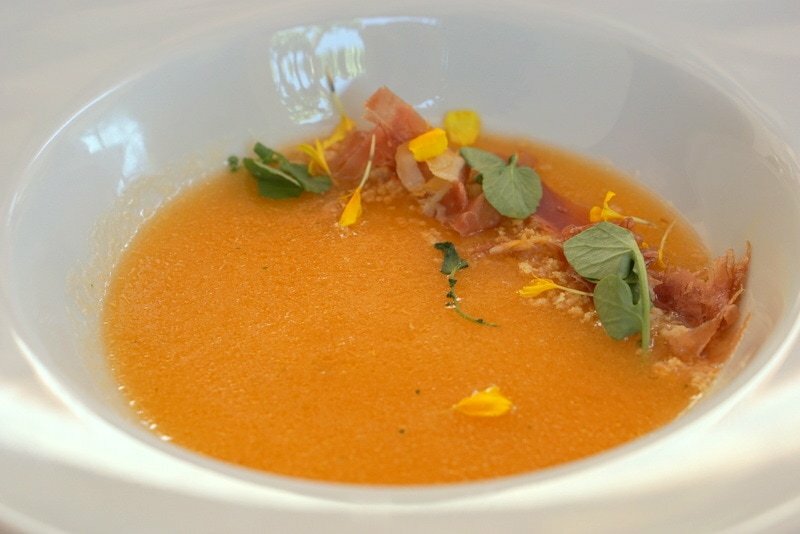 The most delicious melon soup I’ve had! Veal over some sort of shortbread– to die for. 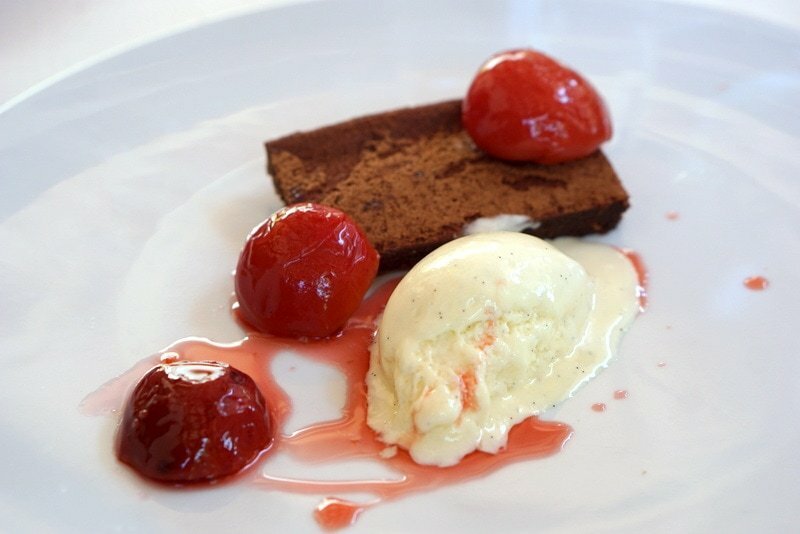 Poached plums, vanilla ice cream and a rich chocolate cake. Our lunch was paired again with local wines– cava, white and red. Everything married perfectly, and I could have stayed there forever. If I ever had a restaurant, I’d want it to be one with a very similar philosophy. Stuffed and slightly tipsy, it was time to go back to Barcelona. 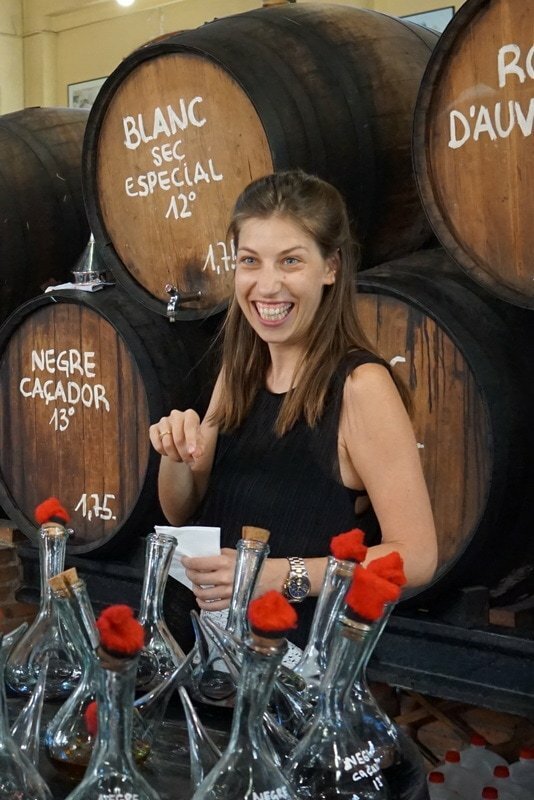 I was beaming with pride– this excellent Barcelona winery tour was planned mostly by our Barcelona team and was one of the first tours that I didn’t directly help plan myself. That was a huge step– it was scary to let go of the control, but after seeing this incredible tour, I realize it’s the only way to achieve my goals for Devour Tours. If you’d like to sign up for our Farm-to-Table Organic Winery Day Trip, it usually takes place a few times a week. We are still trying to spread the word about it, which will hopefully help us keep it afloat! 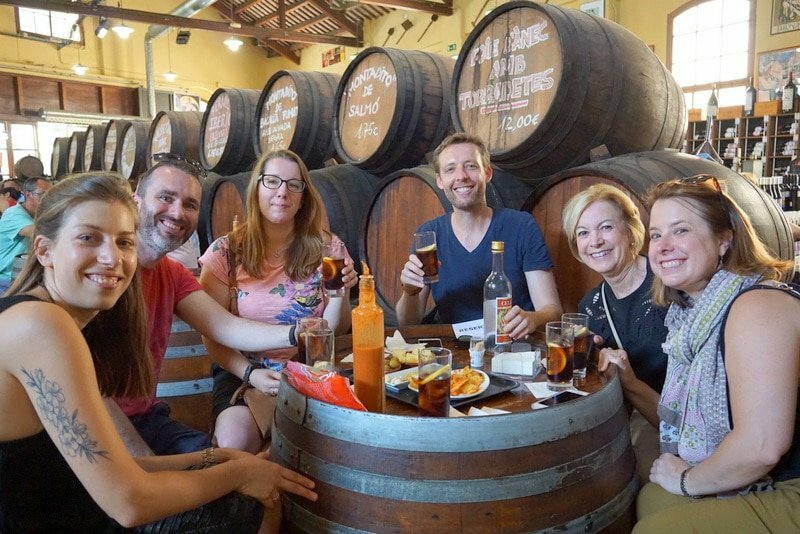 I know that there are much less expensive options for wine trips from Barcelona (and I’ve taken a handful of them) but I can tell you with all sincerity that our tour is the highest quality– truly VIP. We’ve taken care of every detail and the food, wine, and guide are the best of the best! We hope to see you soon in Barcelona! 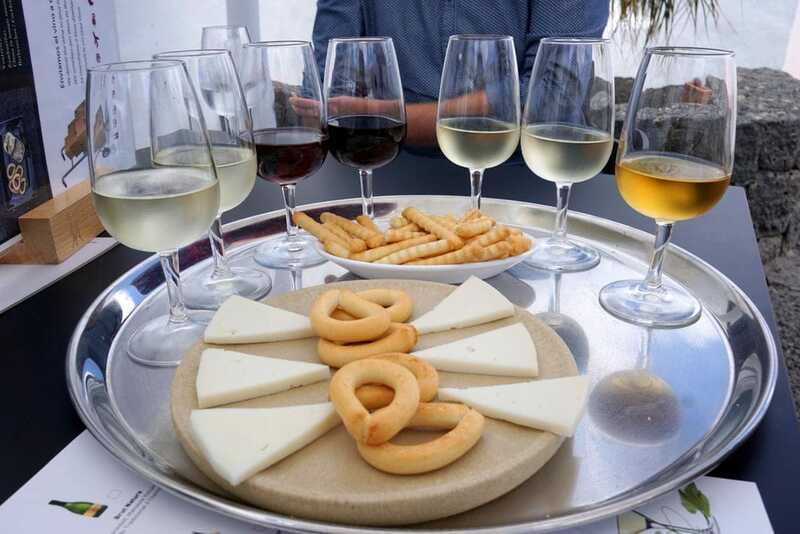 Check out Devour Barcelona here, we offer all sorts of walking food tours, tapas tours and this awesome Barcelona winery tour of course! Congrats, Lauren! Delegation is the key to long-term growth. Looks like you’ve just seen it work for you. We are thinking about going to BCN next February/March. 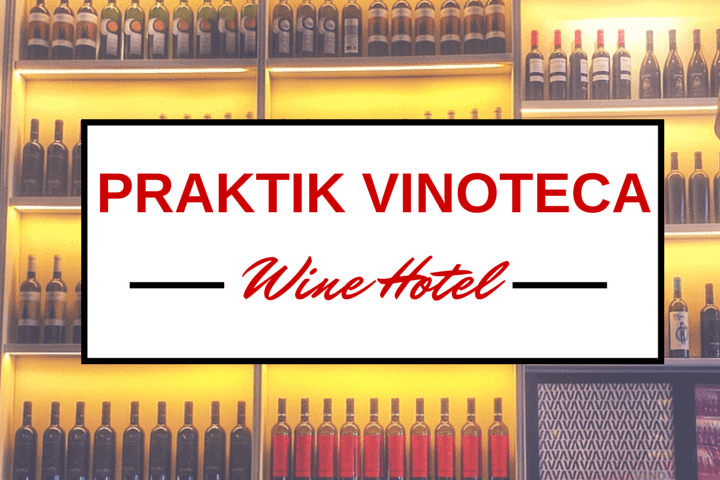 We want to spend a few days in the city and I’m interested in your tours, especially the wine tour which you just talked about in your blog. Please keep me up to date on your tours–I’ll let you know when I have definite dates! Thank you! 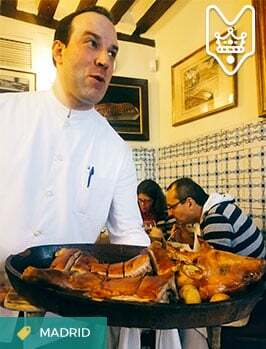 Pingback: Barcelona Gastro Guide: Where to Eat in Barcelona - An Insider's Spain Travel Blog & Spain Food Blog!